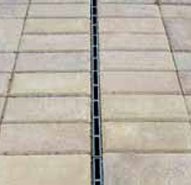 HexaDrain Brickslot is a recyclable polypropylene slotted trench drain system that provides effective, yet discreet, slot drainage in domestic paver or tile installation. Cellular construction allows for simple �pushfit� of channels and accessories. Access to system for maintenance is through the removable cover on the corner unit. Call 800-277-5015 to place your order for Hexadrain Brickslot!